Two-day, offroad adventure to fabulous “Doll House” spires. Regardless of which route you take to get to the start of this trail (trail 70, 74 or 75), it’s a very long drive. Once on the trail, you’ll find it’s the most difficult of the trails in the Maze. Your efforts will be rewarded with stunning views of dramatic rock spires. The end of the route features unique “Doll House” clusters. For impressive pictures, camp overnight to capture sunset and sunrise. Great hike to Colorado River. 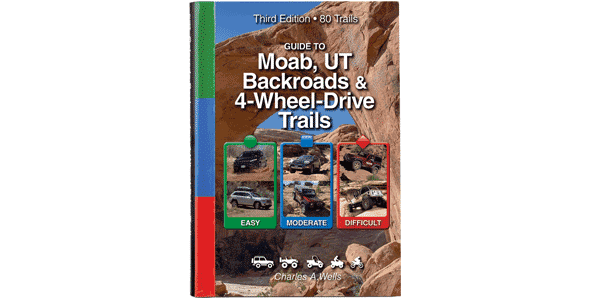 Make sure to read the Area 5 introduction on page 198 for rules and regulations for the Maze area and important driving tips. Several sizable rock ledges with tight maneuvering. Soft sand in washes. We did it in our stock 4-door Rubicon using very careful tire placement. Some backcountry driving experience is recommended.